On a recent, chilly October morning, I made my way to a local coffee shop to begin my work day. I was prepared to order my almond milk latte and start scheduling a client’s social media posts but when I entered the store, my usual cozy spot by the fireplace had been commandeered by a consultant-based cosmetics company, bathed in the pink glory that has come to represent Breast Cancer Awareness Month. They were handing out sachets spritzed with perfume in exchange for a donation to the cause and I couldn’t help but think that the good they were doing by raising awareness was sort of canceled out by the fact that the scents they promoted were a semi-toxic mix of chemicals, many of which have been shown to be endocrine disrupters that can actually increase your likelihood of developing cancer. The phenomenon that is the pink ribbon has taken over the month of October, with the recoloring of everything from NFL uniforms to food to beauty products. But why is a month dedicated to raising awareness (and millions of dollars) for a potentially deadly disease also promoting products that have been shown to contribute to giving people cancer? It’s called pinkwashing and it’s getting a little out of control. 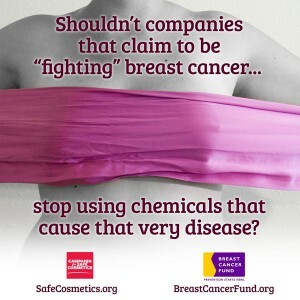 There’s a long list of companies that claim to care about breast cancer awareness and prevention, and jump on the bandwagon by adding a pink ribbon to their goods for the month of October, but that are, at the same time, manufacturing products that have been linked to cancer. We see it in many arenas come fall, but one of the most concerning is the beauty industry. We’ve talked before about how the cosmetics industry isn’t regulated and how how the United States bans only 11 ingredients for personal care products while the European Union has regulations on 1,328. What this means in reality is that many ingredients that make their way into our shampoos, foundations, blushes and lipsticks have long-term, potentially dangerous side effects including cancer. If you peruse the Environmental Working Group’s Skin Deep Cosmetics Database, you’ll see how many “standard” ingredients have been shown to be hormone disruptors or appear as pollutants in men, women and children who’ve been biomonitored. So, why are we supporting companies that knowingly choose to use ingredients that eventually contribute to the prevalence of cancer in our society? Because that knowledge hasn’t always been available to consumers. We assume that, when we step into a drugstore or department store to stock up on our skincare necessities, someone has vetted the products we’re shelling out our money for, whether they be that cheap, glitter lip balm or that high-end anti-aging treatment. We think that we can trust everything that’s been bottled, branded and brought to us, courtesy of the beauty aisle’s shelves. But we can’t. And, instead of feeling paralyzed by that knowledge, I challenge you to feel empowered. Now that you know that you actually have to pay attention to the products that go on your skin, you can make a difference in how the beauty industry operates. Instead of fueling the big beauty business with our dollars, let’s take matters into our own hands and show them that we want products with ingredients that are good for us, that help our bodies, that prevent things like cancer and that make us feel good. Be vocal. Tell those big beauty companies why you stopped buying their products. If you’ve broken up with their lipstick because it contains lead, they should know about it! Educate yourself. This isn’t about scare tactics or condemning ourselves for knowledge we didn’t have before. But now that you know a little about what might be in your cosmetics, you might think differently about the choices you make when you buy beauty products. And even if you still want to buy that favorite lotion or perfume, at least you’re a conscious consumer. Keep tabs on the ingredients in the products you use with Skin Deep (available online or as a fun app!) or pick up a copy of No More Dirty Looks to learn more about ingredients to avoid—and what to use instead! Let your money talk. Invest your dollars in companies who actually care about the ingredients they use (and not just the hottest new concoction guaranteed to produce “visible results”). There are so many fabulous beauty companies out there, from artisans to bigger brands, that spend their time and energy insuring that the products they make for us are both good for our bodies and effective. Spend your money on those products and sooner or later, those big beauty brands will have to take notice! Get involved. Participate in an event that not only raises money for breast cancer awareness, but is also trying to prevent it. You could even join Organic Bath Co. (if you’re in the Massachusetts area) on Tuesday, Oct. 28, for New England Night for Wellness benefitting Art beCAUSE, a Boston-based Breast Cancer Foundation that’s dedicating its efforts to discovering the environmental factors that can contribute to cancer—and then informing the public about how to avoid them. Follain will be there giving mini-makeovers, DRINKmaple, Motto and MISE Wines will be doing tastings and Supplet will showcase a few products from their subscription pregnancy boxes. What’s your take on the pinkwashing phenomenon? How can we support companies that are actually investing in us? Everyone seems to be on the pink bandwagon, even crazy things like clothiers. It definitely makes me re-think where I spend my dollars.